The equine hoof is extremely complex, but you wouldn’t know that just by looking at it. It’s made up of several different parts, all serving a different purpose, yet working in symmetry to keep the horse sound and healthy. The hoof can be broken into three different areas for better understanding of its structures and purposes: outside, underside and inside. The first part of the hoof that you see is the hoof wall. This is the hard, horny outer covering that houses and protects the more delicate structures within, supports the weight of the horse and absorbs shock as the horse moves. 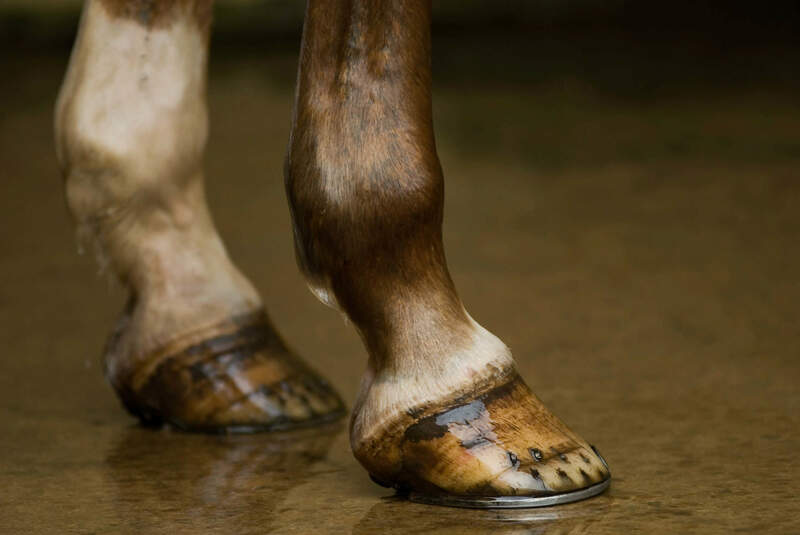 The hoof wall does not have nerves or blood vessels; it’s a continually growing, keratinous material that needs to be trimmed or naturally worn off. A healthy hoof wall grows about 3/8 of an inch per month. The hoof wall can either be black or white. While there is some belief that black hooves are stronger than white hooves, that’s just a myth. 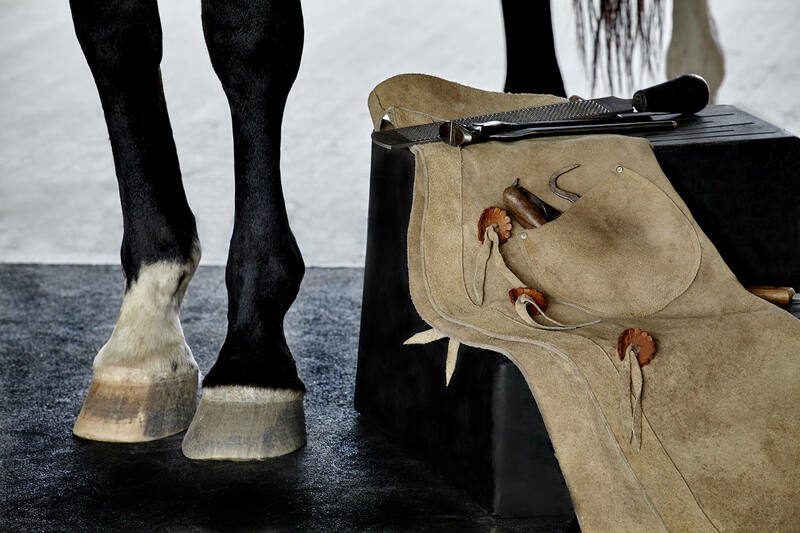 Farriers will confirm that the quality of the hoof is not affected by its color; all four hooves on a horse are structurally designed the same. The hoof wall is an inflexible surface and cannot expand when an injury causes the tissues inside to swell. If a horse damages the internal structures of the hoof, it can cause a lameness. Healthy hooves should not have any cracks or rings. Cracks can make the internal structures vulnerable to potentially damaging substances, like gravel or germs. Rings on the hoof can indicate that the horse may have some additional health problems that are affecting his hooves, so your veterinarian should be consulted. The coronary band is at the top of the hoof wall where the hairline meets the hoof. This band encircles the top of the hoof wall and is usually light in color. It is the primary growth and nutritional source for the hoof wall. Although its structure is tough, it also contains a large blood supply. Injury to the coronary band can result in damage to the hoof wall or disrupt proper hoof growth to the point where the horse may no longer be rideable. The periople covers the soft area just below the coronary band and helps protect the hoof wall. The soft area is made up of newly formed hoof wall tissue, and the periople helps give it time to harden. The inner wall of the hoof is more pliable than the hard outer wall. This extra “give” allows the inner wall to expand a bit with movement and absorb shock, protecting the vital inner parts of the hoof.The inner wall supports a multitude of leaf-like laminae, which attach the coffin bone to the inside of the hoof wall. These laminae bear much of the weight of the horse. The sole is the underside of the hoof, but most of it does not make contact with the ground because it is a bit concave. The structure of the sole is similar to that of the hoof wall; however, the keratin found in the sole is more easily rubbed or worn down than that found in the hoof wall. The sole also helps to protect the inner workings of the hoof, and is designed to bear internal weight transferred through the border of the sole rather than weight from the ground. One important area of the sole is the “white line,” which may actually be somewhat yellow in color. The white line is the junction between the hoof wall and the sole. The tissues of the white line area contribute to sole protection and help attach the sole to the inner wall of the hoof. When the white line area becomes impaired, it allows germs to enter and separate the layers of the hoof wall. Once this happens, it can spread throughout the hoof and make the horse lame. When you pick up the horse’s hoof, the frog is immediately obvious – it’s the tough, thick, V-shaped structure pointing down from the heels. It protects the digital cushion beneath it, aids in traction and circulation in the hoof, and partly acts as a shock absorber when the horse moves. The sensitive nerves in the frog communicate to your horse where his feet are and help him feel the surface on which he is standing. There are grooves in the center and on each side of the frog. The groove down the center is the central sulcus, and the grooves on either side of the frog are the central and lateral sulci. The central sulcus should be fairly wide and shallow. Horses with contracted hooves or sheared heels may have a narrow or deep sulcus, which can harbor germs and lead to thrush. The bars are extensions of the hoof wall that turn-in at the heel and run partway along the frog. The bars strengthen the heel area and control overexpansion of the heels. This area also contributes to building the sole of the hoof and helps support the horse’s weight. The digital cushion is the area below the coffin bone towards the back of the hoof. It does exactly what the name implies: it is a cushion of cartilaginous material with some “give,” acting as one of the main shock absorbers in the hoof. Horses with a long toe, low-heel conformation may have a compromised digital cushion, as the heels are load-bearing more weight than normal and it slowly compresses the cushion’s thickness. Once the digital cushion is “crushed,” it will not regenerate. The coffin (or “pedal”) bone is the bottom bone located near the toe and encapsulated in the hoof. It is the largest bone in the hoof and helps to shape the hoof wall. It’s surrounded by special tissues that help make-up the laminae of the hoof wall, as well as, the tissues of the sole. Anything that upsets the working relationship between the coffin bone and the hoof capsule, such as major shoeing changes, sole puncture and rotation of the coffin bone, can result in lameness. The navicular bone (also called the distal sesamoid bone) is the small bone that is tucked behind the coffin bone and the short pastern bone. The navicular bone helps stabilize the coffin bone and allows for some tilt over uneven ground. There are two major tendons that help support and move the bones – the extensor tendon and the deep digital flexor tendon. The extensor tendon attaches to the front of the coffin bone and straightens the leg; whereas, the deep digital flexor tendon runs down the back of the leg and wraps around the navicular bone, bending and flexing the leg.